Kaizen or continuous improvement is in fact a process. So there are steps and activities. And there are performance indicators. In this post we will give more information about the performance indicator “number of improvement suggestions”. Other performance indicators for continuous improvement are described here. 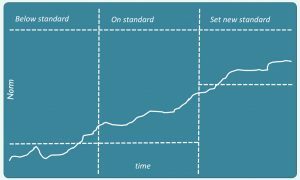 The best performance indicators of continuous improvement are lower cost, shorter leadtime and improved quality. Definition: the number of submitted improvement suggestions by a person, team or organization. The higher the number of improvement suggestions the better. But this number doesn’t give information about the quality and the value of the submitted suggestions. It is an interesting indicator for teams who have just started with Kaizen or continuous improvement. Tell me how you measure me, and I will tell you how I will behave.